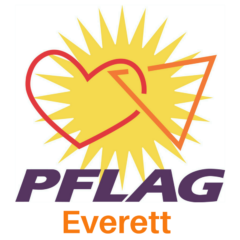 PFLAG Everett is a chapter of PFLAG National serving residents of Snohomish County. We are a support, education, and advocacy group and the extended family of the LGBTQ community (lesbian, gay, bisexual, transgender, questioning/queer). We’re made up of LGBTQ individuals, family members, and allies. Wherever you are on your journey—just starting out or are a long-standing member/ally of the LGBTQ community—PFLAG Everett is here for you.